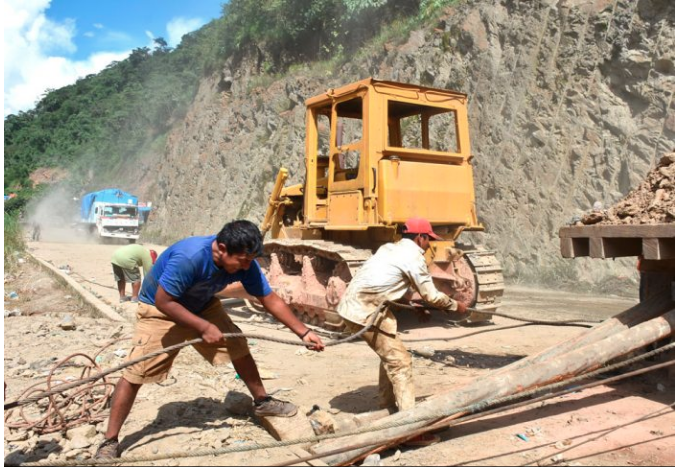 Stabilization work in the Armas bridge sector, in the Santa Bárbara – Caranavi section, route that was affected by the landslide. As a result of the rains and floods in different departments of the country, 22 municipalities were declared in disaster and 16 in emergency, according to the defense minister, Javier Zavaleta, said yesterday through the state channel. As a result, he indicated that 4,436 families were affected and had to leave their flooded homes to protect their safety. “In total there are 38 municipalities that have had or are having problems mainly due to flooding, others due to landslides,” said the authority. In addition, he pointed out that there will be more problems because the rains will continue in February and part of March. “The statistics and the meteorology reports tell us that we are going to have even more incidents, so we maintain alert levels,” he said. Zavaleta pointed out that 52 tons of humanitarian aid have already been transferred to the disaster sites. On the other hand, the National Service of Meteorology and Hydrology (Senamhi) issued red and orange alerts for the following days in Cochabamba, Beni, La Paz, Santa Cruz and Tarija. The government decided to suspend solidarity flights to Beni and northern La Paz, after transferring a total of 2,300 people affected by natural disasters, according to minister Zavaleta. The authority said that decision was made after enabling the passage in the Puente Armas sector, on the stretch Santa Bárbara – Caranavi, route that was affected by the landslide last weekend. “Last night (on Saturday) has been our last flight, and people are going to be able to move as before, by their means,” he said in the same interview with the state television station. However, the search for the disappeared continues in the Yungas, now in the river sector. “We have asked our search and rescue groups to rake the entire river, downstream, to see if we can find someone else. While there is passage and where we can, we are still trying to find people who have died there,” said the authority. Bolivian Thoughts opinion: Every year we read about these events, sometimes tragic, an d I simply do not understand why the government fails again and again … its inability to prevent and mitigate these floods is simply the reality of having a lousy populist in the government. evo must end his illegitimate term and leave office, this year, for good! This entry was posted in Beni, Bolivia, Business, Cochabamba, Environment, La Paz, Santa Cruz, Social Unrest and tagged floods, government failures, rainy season, Tarija. Bookmark the permalink.